Hampshire Police are urging more people to come forward and report so-called sextortion - after more than 100 in a year. It's where criminals blackmail people after tricking them into intimate acts on a webcam. Nationally, cases have more than doubled in 12 months. 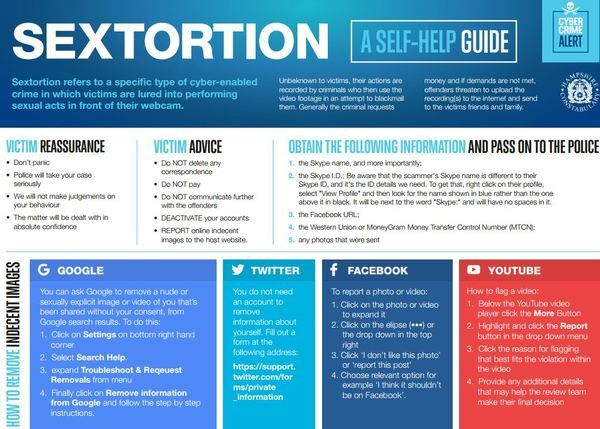 Hampshire Police are campaigning to raise awareness of sextortion, which is a form of cybercrime and blackmail during which victims are lured into performing sexual acts in a front of webcam or a camera on a smartphone. The victims are unaware their actions are being recorded by criminals who then use the video footage in an attempt to blackmail individuals. Sextortion offenders typically threaten to upload video recordings to the internet, sending the footage to a victim's family and friends if demands, usually for money, are not met. "Sextortion is a crime that involves the deception, manipulation and intimidation of someone with distressing and devastating effects. The consequences can be as severe as suicide and self-harm. "Victims we know about already are mainly young men aged between 17 and 23; they are targeted by offenders claiming to be women asking to be friends on social media. Discussions online attempt to seduce, entice and entrap a victim into sexual behaviour that escalates on camera to an extent where blackmail threats are made. "Younger men do not always have the emotional strength to cope with blackmail. Therefore, a key purpose of our campaigning is to give more victims the confidence to confide in police about any situations or threats they've encountered. "Our research to date suggests that sextortion is hugely under-reported as a crime. More than 100 offences of this nature were recorded by Hampshire Constabulary during 2015, and we want to ensure police and our partner agencies have the best possible understanding of how this threat is endangering lives so our service to victims is effective and consistent. "Our campaigning is also focused on increasing awareness of the warning signs so more people can avoid putting themselves in a vulnerable situation where they could be exploited and extorted in a way that could have lasting repercussions for their life. "I'd like to take this opportunity to thank every partner agency that has assisted Hampshire Constabulary in reinforcing its service to the victims of this appalling crime." "I was working night shifts on my own. This meant I could not meet up with friends and had no social life. I was lonely so I tried going online to meet people. "I would go online once an evening over the course of a few months. I went on different dating websites, wanting to get to know people on there. This made me happier. I felt better. One of the people I'd been talking to suggested I go onto Skype. I'd been talking to them for a while so I thought why not? They seemed persistent, which in hindsight was the first warning sign. At the time I was going with it. I was receiving quite a few messages, once a day or twice a day. She'd asked me for my Facebook profile and picture. The conversations had lasted a week or two, more than previous ones. "It seemed normal then this woman started talking intimately. She invited me onto Skype where she looked similar to her profile picture. She was half way across the room. It lasted for around 30 to 45 minutes, all on the phone. She said 'show me a bit more, and show me your face'. "Then the messages came up - 'pay £500 or this is going all over Facebook. I want £500' then she started listing my friends' details. I said I could not afford £500, she said £200 was the lowest. I said I could only pay £50. I offered to go to the bank but went to the police instead. I was trembling throughout the whole thing, shaking and thinking 'what's going to happen?' This will ruin my life and did not know what to do. "If this video is released onto Facebook, what would I do? What's going to happen with my job? What will my friends think? I thought about suicide, it would have been too embarrassing. I would not have been able to face anyone. But I went to the police, and kept her talking by saying I was at the bank. "Messages came through abusing me and saying 'I will keep doing it'. The police officers handled it well. They stopped and helped me through it. They made me feel better. I needed to talk to someone. Since then I've tried to put it to the back of my mind, and I've moved on with my life. There is always life afterwards. But I would not be here today if I had not spoken to anyone." If you have been affected by sextortion, contact Hampshire Constabulary by phoning 101. Mini-com users can phone 18001 101. In a life-threatening emergency, always dial 999.